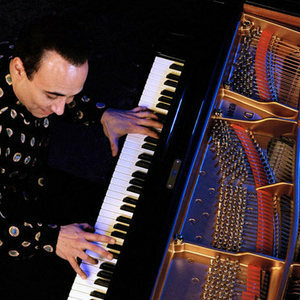 Michel Camilo (born April 4, 1954) is a pianist and composer from Santo Domingo, Dominican Republic. He is known as a great jazz, latin and classical pianist with superb technical ability, and has played and recorded with many world-famous musicians. Michel lists some of his main influences as Chick Corea, Keith Jarrett, Oscar Peterson, Bill Evans, and Art Tatum. Michel was born into a musical family and as a young child showed great aptitude for the accordion that his parents gave him. Michel was born into a musical family and as a young child showed great aptitude for the accordion that his parents gave him. Although he enjoyed the accordion, it was his grandparents' piano that sparked his interest the most, so at aged 9 he asked his parents to buy him one. Their response was to first send him to the Elementary Music School, part of the National Conservatory, and then a year later to grant his wish. ?The first time I heard jazz was when I was 14 and a half. I heard the great Art Tatum on the radio playing his solo piano rendition of 'Tea for Two.' That immediately caught my ear. I just wanted to soak it in, to learn to play that style. Then I found out it was jazz.? Michel studied for 13 years at the National Conservatory, and whilst developing his strong classical abilities was also heavily influenced by the bop tradition, and by the contemporary jazz of Herbie Hancock, Keith Jarrett and Chick Corea. His influences at this time also included Horace Silver, Erroll Garner, and the ragtime music of Scott Joplin. When the Harvard University Jazz Band visited the Dominican Republic and heard Michel at a jam session, the bandleader encouraged him, 'You should be in the States', and so the idea was planted. In 1979 Michel moved to New York to study at Mannes College and at The Juilliard School, and broke onto the international stage in 1983 when Tito Puente's pianist was unable to make a concert at the Montreal Jazz Festival. On a recommendation, without hearing him, Tito asked Michel to play. Cuban reedman Paquito D'Rivera was in the audience, and immediately offered him a place in his band. For four years Michel toured internationally with Paquito, and recorded two albums with him. Michel's emergence as a star in his own right began around 1985, the year he debuted with his trio at Carnegie Hall. In that same year he toured Europe with Paquito D'Rivera's quintet, and recorded his first album, Why Not?, for Japan's King label. In 1988 Michel debuted on a major record label, Sony, with the release of Michel Camilo. This became a bestseller and held the top jazz album spot for ten consecutive weeks. Other bestselling albums followed and so did the accolades, including a Grammy and an Emmy. Michel's collaborative 2000 album with flamenco guitarist Tomatito, Spain won Best Latin Jazz Album in the first Latin Grammy Awards. As well as being an outstanding performer, Michel is a talented composer and has written scores for several Spanish language films including Los Peores A?os de Nuestra Vida and the award-winning Amo Tu Cama Rica. Michel tours extensively, and lectures in Europe, the US and in the Puerto Rico Conservatory. He holds several honorary degrees, a Visiting Professorship at Berklee College of Music, and has been honored in his home country by being named a Knight of the Heraldic Order of Christopher Columbus, and being awarded the Silver Cross of the Order of Duarte, Sanchez & Mella.